Few today doubt that Jesus was viewed by many of his contemporaries as a miracle worker. And many scholars today would agree that Jesus was a healer and an exorcist. But what does this mean? Was Jesus simply a master at relieving psychological distress, a healer of psychosomatic illness, a purveyor of paranormal therapy? What distinguished Jesus from other miracle workers of the ancient world? And what should we make then of his stilling the storm, his walking on the sea, his feeding of the five thousand? In this study of the miracles of Jesus, Graham Twelftree extensively examines the miracles within each Gospel narrative. He evaluates Jesus' own understanding of the miracles, weighs the historical reliability of the miracle stories, and considers the question of miracles and the modern mind. This book maps and explores the borderlands between the affirmations of faith and the conclusions of historical method. Are some miracles simply more open to historical verification than others? With the historical study of Jesus once again capturing the attention of the media and the public, this timely book courageously steps forward to investigate the hard questions. 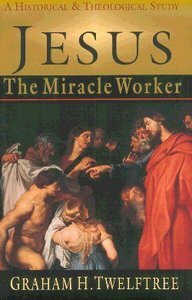 Jesus the Miracle Worker is a comprehensive and textbook study of the miracles of Jesus, written by a recognized expert in the historical investigation of the exorcisms of Jesus. About "Jesus the Miracle Worker"
Graham H. Twelftree (Ph.D., University of Nottingham) an Australian, is distinguished professor of New Testament at the School of Divinity at Regent University, Virginia. In addition to many scholarly articles and reviews, he is the author of a number of books, including In the Name of Jesus: Exorcism among Early Christians; Jesus the Exorcist; Jesus the Miracle Worker; and People of the Spirit: Exploring Luke's View of the Church.